View More In Paracord - Page 2. QUALITY YOU CAN COUNT ON - This 5-Pack of Premium Stainless Steel TITAN Survival Bow Shackles can be used for all of your premium paracord crafts and survival bracelet needs. 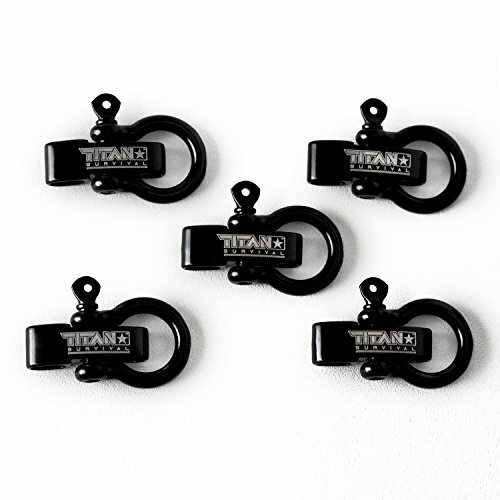 All Shackles are black and come with the TITAN Survival logo laser-etched into the finish. SHACKLE DIMENSIONS - These paracord shackles / buckles have been designed to fit most paracord bracelet and survival bracelet configurations. Bow Thickness = 3/16", Bow Length = 1.4", Bow Width = 1", Shackle Length = 1.4", Shackle Width = 0.5"
COMPACT AND ADJUSTABLE - 3-Position Adjustable clasp allows a single bracelet to fit multiple wrist sizes. Perfect for crafters who design premium paracord products and other crafts. CAN BE USED IN AN EMERGENCY - The TITAN Bow Shackles have a large gate opening of 1/2" (13mm) which makes attaching to the adjustment clasp, or other equipment very easy. In addition, this clasp can hold up to 1,650 lbs. in an emergency. LIFETIME GUARANTEE - All TITAN Survival gear comes with a LIFETIME Guarantee. If you don't like the product for any reason, just return it...no questions asked. If you have any questions about this product by Titan Paracord, contact us by completing and submitting the form below. If you are looking for a specif part number, please include it with your message.